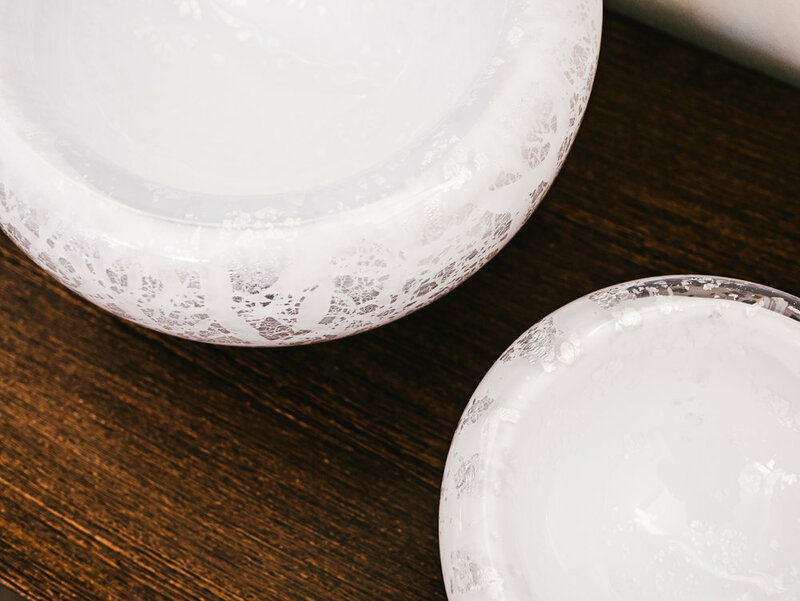 OUR ICONIC STORM BOWL HAS BECOME ONE OF OUR MOST LOVED AND SOUGHT AFTER DESIGNS. The Storm bowl is created by first blowing a sphere form in the hot shop then through some very careful forming we push the outside surface back on itself to create a kind of double walled bowl. The final outcome is the Storm bowl looks and feels reassuringly weighty. when you pick a Storm bowl up you think that feels good and solid. Due to the optical effect of this bowl with its thick layer of clear glass over the base in colour you will be transfixed by the luxurious depth created. often a person is not sure wHere the surface of the glass starts and finishes. contemporary and calm. The Storm bowl comeS in two colours Black and White and in a Variety of luxury options cased Gold leaf and cased pure Silver leaf.